mundane jane: Like a Supreme Court appointment, but without the fancy robe. Like a Supreme Court appointment, but without the fancy robe. When I was in high school, every girl was required to take Home Economics class. For the four semesters of our junior and senior years, we learned to sew an apron, follow a recipe, manage a family budget, and differentiate between Queen Anne and Hepplewhite furniture styles. As far as the Board of Education was concerned, these were the skills we were going to need as we made our way out into the world. And yes, I stayed in a snit for two school years straight. Although we hit the high points of parenting in those classes, there were a lot of things about mothering that I didn't know. More than anything though, I was shocked to discover that my last moment of peace-of-mind was the one right before the doctor readied the forceps. I thought of this last week, when a friend told me that when he visited his grandmother at the end of her life, the last thing she said to him was, "Honey, you be careful." She was worrying about him, right up until the very end. Almost 23 years into my motherhood gig, I'm still staying awake nights. I try to remember this when my mother and I argue because she's forgotten that I am as old as Castro's regime. And when Muffin Uptown gets irritated with me for pretty much the same reason, you needn't think that I'm above pointing it out to her. I'm no longer baking cupcakes for homeroom, waiting in the car rider line, or reading stories at bedtime, but I'm thinking about her more minutes than I'm not. What's more, I can't imagine a future when that won't be the case. In July, she's lighting out for New York City, and it's going to be all I can do not beg her to let me go along. We've already done this--when I left her at college her freshman year and then last year when she went to LA on an internship. I was hoping it would get easier, this watching her walk away. Instead, it's Groundhog Day, over and over again. Which is how I know that the worst part of the whole thing--for both of us--will be me trying to get in all the last minute reminders before the car rolls out of sight. "Do you have your cell phone? Is it charged? Do you have your charger? What about money? You guys split that cash between you--don't carry it all in one place. If you run low, let me or your daddy know; don't you run completely out of money. I don't want you going without food. Don't you kids be sleeping in the car..."
There's no end to it. If I keep talking, and she keeps listening, I may happen upon something that I haven't already said to her, but that I should have. Because that's the real fear: that I've forgotten to give her something really, really important. And this may be my last chance. 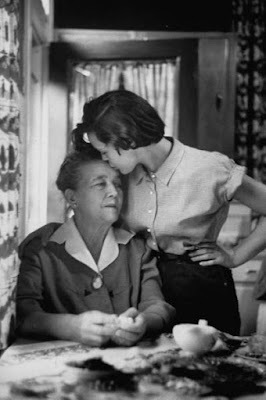 photo, Gordon Parks, 1953, Life photo archive. Related: The city of angels plus one. One day I'll turn up missing a hand and I'll say to you, "NO ONE TOLD ME." This made me smile, as the almost-25-year-old daughter of a worry wart. My mom's favorite, "Now don't you be talking on that cell phone in the car, y'hear? I'M NOT KIDDING!" But she has a point... I wrecked the car and my spine while trying to answer a phone call FROM HER on a rainy Thanksgiving day. One comment you never, ever outgrow--"But Mom, I'm almost __ years old!" Since I'm about to have a former "little girl," this has totally bummed me out. I heard the very same thing years ago when I asked you if Muffin Uptown was going to 5th Grade camp. This fear will never go away, thank god. In high school I had Gloria Steinem glasses and my manicured fist in the air. No Home Ec for me, thank you. I wasn't falling prey to the male oppressor. Not me. But Gloria never had kids and I eventually did. Not that Home Ec would've prepared me. Worrying about our children is involuntary respiration.